Coaching Corner Thanksgiving: Who is the biggest chicken? Chances are that throughout Thanksgiving, you’ll have your aunts asking questions about your love life, uncles trying to determine what career path is best for you and elder members of your family preaching about liberals and/or immigrants are destroying America. However, there is a silver lining: we’re about three-quarters done with the NFL regular season and almost a month before the playoffs begin. As is deafeningly obvious from Coaching Corner, NFL head coaches play an integral role in their respective team’s chances for success – especially in how they go about making fourth-down decisions. Therefore, with nothing better to do and a lot of time on my hands this Thanksgiving, I have created the “Chicken Index” for each NFL team this season. 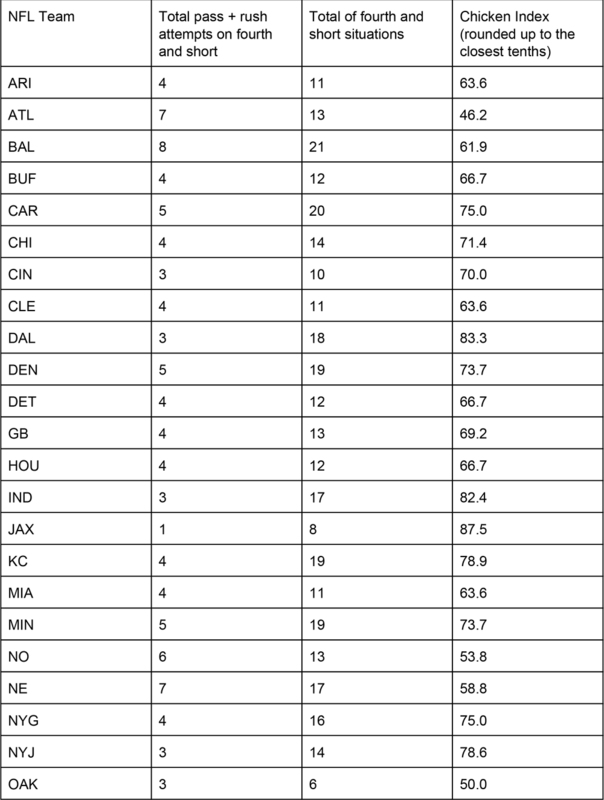 Using Pro Football Reference’s Game Play finder, I created a data table containing the number of non-kneeling conversion attempts on fourth and short (defined by needing two or less) and the number of total fourth and shorts for each team. The most important number, of course, is the CI - which takes the number of field goal and punt attempts over the total number of fourth and short situations and multiplies the result by 100. In case you don’t understand why the statistic is named that way: it’s meant to measure which coaches/teams are most likely to go “chicken.” The higher the number, the more that they either kicked a field goal or punted. Below is the full list for those who’d like to look, but feel free to scroll further to view the top five coach/team combos of the CI, along with the coaches who ranked as more likely to be aggressive. While Bradley’s status as the top “Chicken” of 2015 might be more due to sample size (only eight plays) than anything else, the rest of his contemporaries on this list are certainly coaches who if not already fired (like Whisenhunt), may lose their job by the end of the season and may have already cost their teams chances at victory in close games. It’s ironic that the decision Pagano was most criticized for was a failed fake punt on a fourth down. As you can see, being aggressive doesn’t necessarily equate to instant success, though it should help in close games. All of these coaches are leading near-average teams, though keep in mind that Kelly (nine plays) and Del Rio (six plays) might be on the list by virtue of sample size. Just missing the cut are the Patriots’ Bill Belichick (58.5), Ravens’ John Harbaugh (61.9) and Cardinals’ Bruce Arians (63.6). Obviously the Chicken Index by itself it’s not an absolute measure of a coach’s value - the higher or lower a coach is on the list doesn’t necessarily mean that they are worse or better. Part of being an effective leaders also comes from knowing how to develop talent, manage players, etc. Take a look at the success of the Panthers, despite head coach Ron Rivera, who according to the above table, does not at all living up to his aggressive reputation and just ranks outside of the five most conservative coaches in fourth and short situations. Moreover, every fourth-down situation carries a different kind of context and thought process - they are not necessarily equal when factoring in field position, weather, time left, game score, two-point attempts, etc. Who knows what would happen if I changed the definition of fourth and short to fit three yards or less instead of two? In these ways, the chart may also not function as a perfect system for measuring aggressiveness. Nevertheless, as we move into the blistering cold of December, it’s important to recognize the need for coaches to make tough decisions on fourth and short. Soon we will see which leaders will lead their teams through the harsh cold and which ones will passively fade away.